As he enters the homestretch in his quest to unseat Republican U.S. Sen. Ted Cruz, U.S. Rep. Beto O'Rourke has honed an attack: Cruz spent too much of his first term running for president, and not enough time representing Texas in the U.S. Senate. During the second debate Tuesday, O'Rourke recited similar numbers and referenced towns waiting for relief funds after Hurricane Harvey, saying the region needed "a full-time senator, not someone who is running for president." According to GovTrack, an independent organization that tracks congressional voting records, Cruz has had one of the highest rates of missed votes in the Senate, in large part because of his nearly 14-month presidential campaign in 2015 and 2016. Through all of Cruz’s first term, he has missed nearly 14 percent of roll call votes, significantly higher than the 1.5 percent lifetime missed votes median in the Senate. But it's not uncommon for candidates seeking higher office to miss a lot of votes. And as their Senate campaign has heated up in recent months, both Cruz and O'Rourke have missed more votes than their chambers' medians. 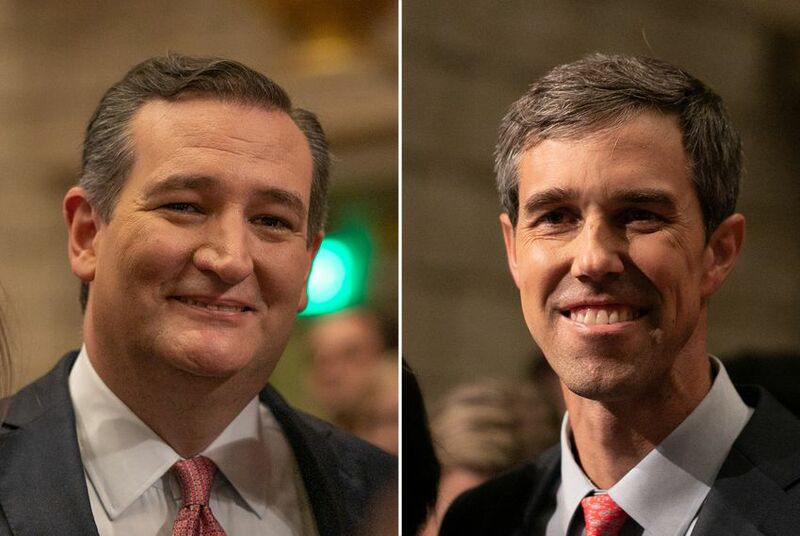 O'Rourke and Cruz have both represented Texas in Congress since 2013 and, to be sure, O'Rourke's attendance record has consistently been stronger. Over his nearly six years in office, GovTrack data shows O'Rourke has missed 3 percent of roll call votes in the House, which is slightly higher than the House median. Cruz's absence rate during his first two years was 6.7 percent, tied for the 16th-highest among senators. Then, he ran for president. In 2015, the year he kicked off his presidential campaign, he missed about 24 percent of votes. In 2016, as he traversed the primary states, he missed just over half. "While the presidential campaign kept him from votes for a period of time, he remained and continues to be a consistent, effective and powerful advocate for the issues on which Texans expect him to deliver," said campaign spokeswoman Catherine Frazier. Senators running for president often miss a lot of votes. From the beginning of 2007 to the end of 2008, then-Sen. Barack Obama missed 46 percent of votes. John Kerry, the 2004 Democratic nominee for president and former Massachusetts senator, missed 72 percent of Senate votes from the beginning of 2003 to the end of his campaign. "The way Cruz ran for president isn’t significantly different than senators over the past half-century," said Rich Cohen, co-author of The Almanac of American Politics from 2001 through 2010 and former congressional reporter for National Journal, Politico and Congressional Quarterly. In 2015, Cruz was the third-most absent senator of the year, behind fellow Republican presidential candidates Sen. Marco Rubio of Florida and Sen. Lindsey Graham of South Carolina. In 2016, he won the Iowa caucuses and outlasted all other senators in the race for president before dropping out in May as it became clear that Donald Trump would win the Republican nomination for president. That long campaign gave him the most absences of the 114th Congress. Overall, he missed about a third of the votes from Jan. 6, 2015 to Jan. 3, 2017, the most of any senator during that period, though he only missed two in the second half of 2016 when he was no longer running for president. "Sen. Cruz ran for Senate on a platform of taking the Texas values of low taxes, low regulations, strong national security, and more freedom to Washington, he fought for those very same principles during his presidential race, and continues to fight for them today," Frazier said. Traditionally, Senate leadership tolerates missed votes during presidential campaigns, as long as the senator remains prepared to return to Capitol Hill for close votes. Still, O'Rourke has suggested that Cruz put personal ambitions over his job as a representative of the state. "Whether you're a Democrat, Republican, Independent or non-voter, all Texans deserve an accountable, full-time, full-service senator who’s committed to working on behalf of people not PACs, corporations, and special interests," ​​​​said O'Rourke campaign spokesman Chris Evans in a statement. When O’Rourke attacked Cruz for his poor vote attendance in the first debate, however, Cruz struck back without directly addressing his absence record. Cruz argued that he has “been on the ground” with the people of Texas continuously after various tragedies: after Hurricane Harvey, the 2013 fertilizer plant explosion in West and the Sutherland Springs church shooting last year. And O'Rourke has had moments where his attendance has lagged, too. From April to June in 2016, O’Rourke missed 19.6 percent of votes, partly due to a four-day trip to Vietnam to promote the Trans-Pacific Partnership with Obama and U.S. Rep. Joaquin Castro, D-San Antonio. O’Rourke also missed 11.1 percent of votes in the first quarter of 2015. In a blog post on Medium, he wrote that he missed two days of votes because of a shooting at a Veterans Affairs hospital in El Paso. And as the two have hit the campaign trail in Texas over the last six months, both have missed votes. From April through October of this year, Cruz missed 11.3 percent and O’Rourke missed 10.8 percent.